Mathew Ingram’s recounting today of blogger Nate Silver’s leap from the New York Times into the welcoming arms of ESPN underscores a trend B2B journalists and editors ignore at their peril. For the moment at least, editorial personal brands are growing more powerful primarily—or most obviously—in big media. My sense is that most B2B journos are largely unaware of the trend, or largely unwilling to hop onto it. Sooner or later that will change, but whether most of the journalists who have the experience to take advantage of the trend will actually do so is an open question. Being an expert in your field is a requirement for a robust personal brand, but not the only one. If you don’t consciously cultivate your brand, it won’t take root in the new media age. That means blogging, using social media, and—you may shudder to think of it—promoting your brand. And need I add, you must do this with enthusiasm? And lest I seem to be piling it onto editors unduly, I should note that B2B media brands need to be as cognizant of this trend as individuals. As Jeff Jarvis said in a tweet Ingram quoted, they need to be thinking of themselves as platforms for building individual brands—something I see few B2B publishing companies doing. Time is running out. The wave of individual branding will overtake B2B media soon, and the only question is whether you’re going to be surfing the wave or struggling in the wake. In last Wednesday’s post, I described how new media make the reader an equal partner in journalism, able to talk back to, as well as compete with, the journalist. The same dynamic similarly changes the journalist’s relation to his or her employer. Journalists no longer need a traditional publisher in order to talk with readers. Formerly, most journalists were, to readers, little more than a name on a page. But in the social media world, they have an increasingly personal and direct connection to their readers. In the terms of commerce, journalists are becoming brands, potentially the equal of their employer’s corporate brand. As all forms of media become more personal, the bonds that link media professional to corporate employer become weaker. At the same time, the connections to social networks grow stronger. For journalists the implications of this trend are simple: embrace social networking, or say goodbye to your career. In a post today on The Wall, Tom Callow addressed the tricky question of ownership of journalists’ Twitter accounts. If employees use a Twitter ID that combines their names with those of their employers’ brands, whose account is it? The issue is more complicated than you might think, and isn’t likely to be resolved anytime soon. Until journalists and their employers alike see Twitter and other social media accounts as equivalent in importance to other brand channels and manage them accordingly, the friction will only increase. 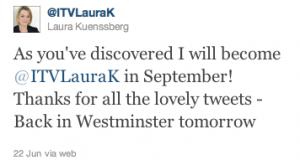 What prompted Callow’s post was the news last month that the BBC’s departing chief political correspondent Laura Kuenssberg, soon to join BBC’s rival ITV, has renamed her Twitter account from “@BBCLauraK” to “@ITVLauraK.” Along with its reporter, the BBC has now lost her 60,000 Twitter followers as well. Tweet under a corporate name, like @comcastcares. Tweet under a personal name, like @johnbethune. Tweet under a hybrid name that combines personal and corporate brands, like @BBCLauraK. In her coverage of the matter last month, The Guardian’s Jemima Kiss rightly remarked that “setting up an account that blends professional and personal is a risky move.” But blending the professional and personal is exactly what social media is all about. If a brand wants to remain relevant, and its editors want to have successful careers, both sides will have to come to terms with that risk and learn to manage it. The first step might be to think of a Twitter account not as a marketing tool or some supplementary appendage to a publication, but as a separate channel for the brand in the same way a magazine is. Now suppose that a publisher named a magazine after one of its editors—the John Bethune magazine, say. I can guarantee you that the editor, in this case at least, would negotiate a detailed agreement on the use of and the rights to his name. I’m certain Readers Digest and Rachael Ray did just that when launching Every Day with Rachael Ray (thanks to @Glenn1126 for the real-life example). A Twitter account should be treated the same way. While extensive contract negotiations over a hybrid Twitter name would be overkill, both editor and employer should come to a clear agreement about who owns what rights. A smart employer will not claim all of them. Without some ownership, an employee won’t be inclined to put heart and soul into it. By the same token, a wise employee will understand that part of the appeal of a hybrid identity comes from the employer’s brand, and that the employer should have meaningful rights as well. That’s one less-than-elegant solution. A better one, I think, is this: don’t use hybrid Twitter names. Like a magazine, a Twitter account needs a clear and unambiguous identity. Brands that want total control can use functional names like @BBCPoliticalCorr, as one of Callow’s commenters suggested. Brands that want the greatest value from Twitter accounts will give up control and encourage the use of personal accounts. Trying to have it both ways is a sure way of getting neither. Does Danger Lurk in the Language of Social Media? No writer can become good at the craft without being sensitive to language. But in other contexts, that vocational advantage can be a liability. This seems to be true of many journalists who resist the benefits of new media solely because of the language used to describe them. When they hear words like user instead of reader, branding instead of reputation, or content instead of editorial, their writerly instincts tell them that accepting such language would be a sellout to the corporate world. They’ve got it wrong, of course. But we should not be too quick to dismiss their reactions. They may be on to something. If the language of new media is so prone to misinterpretation, is it not also dangerously vulnerable to manipulation? That was the lesson I took from Gene Weingarten’s criticism last month of the new-media concept of personal branding. When the Washington Post columnist wrote that branding is ruining journalism, he set off a barrage of rejoinders from personal-branding advocates, most notably and prolifically Steve Buttry. But while I’m firmly on Buttry’s side in this debate, I worry nonetheless about the vulnerable duality of much new-media vocabulary. There is, I suspect, a troubling nub of validity in Weingarten’s reaction to it that should sound a note of caution for all of us new-media enthusiasts. If on the one hand social media has co-opted the language of corporations and humanized it, there is an equal likelihood that corporations will try to do the same to the language of new media. In the blink of an eye the emphasis in the phrase personal branding can shift from humanizing a brand to branding a human. Similarly, I worry about a phrase like content marketing. When Joe Pulizzi talks about it, I’m ready to leap onto the barricades with him and raise the banner for personalizing and equalizing the relationship with customers through great editorial. But how many corporations will see it only as another tool for trapping yet more leads into the ever-ravenous sales funnel? If a writer as sensitive to the subtleties of words as Weingarten can mistake the meaning of personal branding, the risk that ruder corporate ears will do the same is high. Will the social media revolution be co-opted? I don’t think so. But its benefits will be slow in coming if its language remains ambiguous. Proponents of new media probably can’t change that language, but they can do the next best thing: constantly and consistently define its key terms.